WHAT IS THE BEST TYPE OF Chamber MEMBERSHIP FOR YOU? What is the best Type of Membership for You? 10% of our members like to attend events: 90% don't. Some have to get something from their membership; others want to get something done through the Chamber. Some business want to support the mission of the Chamber: others want free marketing services. Some value our public policy efforts: others want to pass out business cards. Some only want to promote their business: others want to engage with the community. 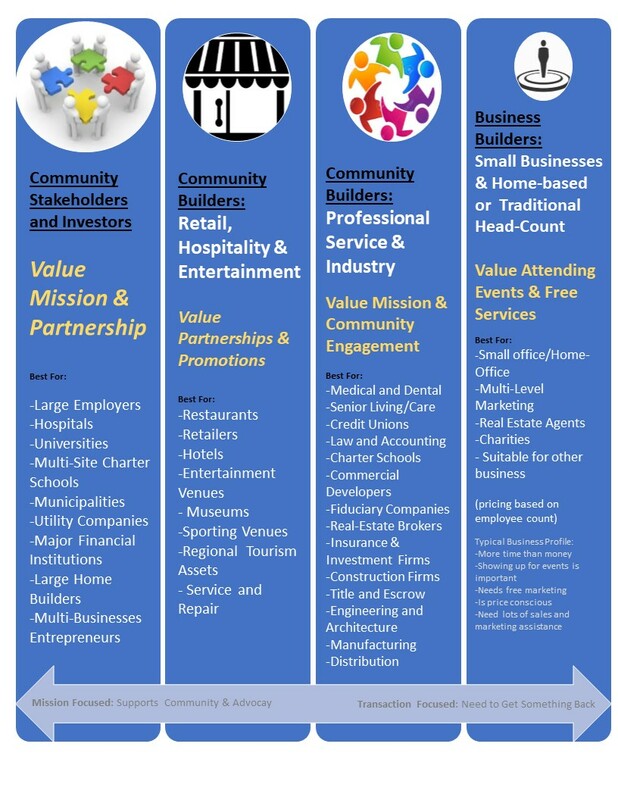 The Chamber has Four Distinctly Different Business Profiles Based on Common Needs and Values. Pick the cluster (Community Builder, Business Builder, etc.) that best describes what you are looking for. CLick the New Member Registration box below and look for your category cluster in the descriptions. Under each category you will find additional options.